Milk It For Spirit is Back for January! The School Milk Foundation of Newfoundland and Labrador is once again offering its Milk It For Spirit promotion, designed to complement our digital education system. 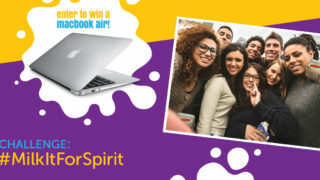 Milk It For Spirit is a social media challenge that encourages spirit building among students in grades 7 to 12. The challenge requires students to squeeze as many bodies and school milk cartons possible into one photo. Students post the picture and tag @SchoolMilkNL on any of our three social media platforms (Twitter, Facebook, or Instagram). It’s important that the students hashtag #MilkItForSpirit along with their school name. An example is provided on the poster. If students are uncomfortable sharing the photo online, they may email the picture directly. When we receive a notification, the student will be automatically entered into the draw for a chance to win a Macbook Air. There are no limits on how many posts per student. This challenge should run for the month of January, 2017. Following January, a randomly selected winner will be revealed via social media. Without a teacher’s consent, posts made during class hours will not be accepted. Students are encouraged to participate during times when digital devices are allowed. The School Milk Foundation recognizes your support of the School Milk Program and thanks you for your efforts in ensuring its success. If you have any questions, please do not hesitate to contact us. What’s the difference between lactose intolerance and milk allergies? Lactose intolerance is a digestive problem that involves a lactase deficiency (lack of the enzyme necessary to digest the natural sugar in milk).